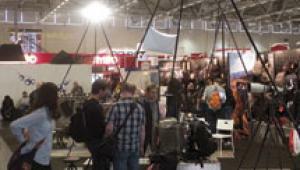 First, a word of encouragement: perhaps the most interesting tripod trend I saw at photokina was the decline of cheap and nasty tripods. To be sure, there were still some that were stamped from paper-thin metal and then afflicted with wobbly, rickety gear-driven center columns; fixed pan-and-tilt heads that are of very limited use for still photography, and destroy sharpness by ringing like a bell when you tap them; unreliable quick-release plates that will dump your expensive camera on the deck; and leg locks that won’t. But they are no longer numerous. 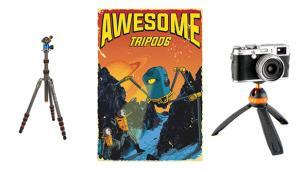 The cheering truth is that good-quality tripods are now becoming the norm, rather than the exception. Equally cheeringly, there was a trend toward lightness, compactness, and ease of use, so that’s where I’ll start, but I should also mention that another, less explicable trend was toward brightly colored tripods and heads. Perhaps they reckon you won’t forget to carry your tripod if it’s brightly colored: I shall not soon forget Photo Clam’s glittering array of multicolored ball heads. All that glisters may not be gold, but it may be Photo Clam. Lightweight tripods particularly interested me because I’d promised a friend I’d look out for a small, light but solid tripod that would fit inside his camera bag: 14” (350mm) long at most. And I quickly found one on the Sirui stand. “How about this?” asked Marty Lipton from Argraph, the US importers. “Fold it up, and it’s the size and weight of a liter bottle of water.” He handed it to me. He was right. Though it’s not cheap, it’s far from expensive for the quality: complete with ball head and quick release, the light alloy version (in blue or red, T-005) costs a bit over $100, and carbon fiber (T-025) adds less than another $100. With a tripod that small, the weight saving from carbon fiber is trivial—a very few ounces—but carbon fiber is much better at absorbing vibrations. Maximum height is 54.5” and it folds to 11.8”. Sirui T-005R (Red); T-025 (carbon fiber); T-005B (Blue). Of course, most of Sirui’s tripods had reversing legs. 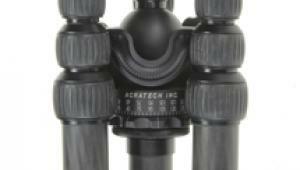 Since these were first introduced by Gitzo four years ago they have taken the tripod industry by storm. Reversing legs fold through 180 degrees, around the extended center column. 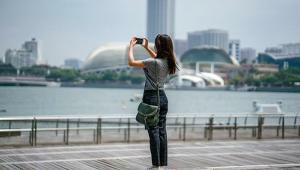 This makes the tripod much more compact—surprisingly so—and in combination with three or four section legs, which most have, it gives you a good working height, too. Increasingly, reversing legs aren’t just a trend: they’re taken for granted. This is true for both carbon fiber and aluminum. You need to choose your head(s) carefully for reversing-leg tripods, though: a big head, or one with awkward projections, can negate the advantages of reversing legs if they can’t close around it. Sirui fold flat, folded flat. Among the other new reversing-leg tripods, the Benro MeFoto Transfunctional Travel Tripod caught my eye, even if it did take me a long time to read the label. It comes with a choice of colored accents: red, green, blue, champagne, and titanium. Folded it is just 15.4” long, but it can be extended to 61.6” and it will support up to 17.6 lbs. You can also remove the center column; unscrew the leg with the leg warmer; screw the two together; and make a 64” monopod. The MeFoto Compact Travel Tripod, available in the same colors, is 12.6” folded, 51.2” extended, weighs 2.6 lbs, and supports up to 8.8 lbs. Matching ball heads with Arca-Swiss-compatible Quick-Release (QR) plates are available. 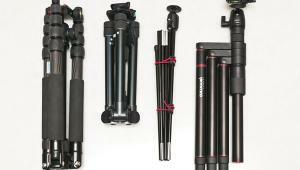 Benro tripods are distributed by the MAC Group. There was quite an emphasis from all manufacturers on redesigning and reworking existing lines to incorporate improved materials and new ideas. 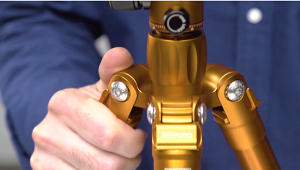 To save weight, many high-end tripods now have lighter, stronger forged bosses (the bit at the top that the legs are fixed to) rather than cast. Some even use titanium bosses. For example, Redged’s tripods are now slightly lighter. They were good to start with, and now they’re even better: smoother to operate, and (if it matters to you) with the apparently obligatory splash of color (red). They were not alone in making improvements, though: 3 Legged Thing’s engagingly named “Brian” is a carbon-fiber tripod with a new improved finish, and Velbon has been very active with 11 new models of the Sherpa, eight new models in the carbon-fiber/basalt composite Geo range, 10 new video tripods, a new tabletop, and their newest travel tripod, the UT-43Q. The folded UT-43Q is just over 10” long and weighs a little over 2 lbs, but extends to just over 60” with the center column extended (54” without). Although the recommended maximum load is 2 kg (4.4 lbs), they say that the maximum it can support is three times that at 6 kg (13.2 lbs). This is another illustration of the irrelevance (and sometimes dishonesty) of some tripod manufacturers’ load claims. Velbon could have claimed the full 6 kg. Several of Vanguard’s new tripods were fitted with what looked like very useful three-way feet: the usual spikes, grippy rubber angled feet, and an accessory “snowshoe,” ideal for use on sand, snow, soft earth, and many other surfaces. Although Slik didn’t introduce any new still camera tripods, they did have a new line of Daiwa broadcast camera supports, while a new model Magnum from Davis & Sanford is aimed at the video market. Vanguard Abeo Plus 323CT with all-terrain feet. 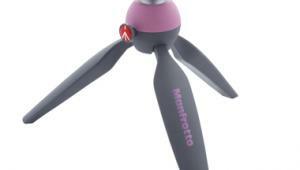 Expect a new lighter tripod line soon from Giottos. Designs were not yet finalized but they have developed an intriguing way of decreasing weight without compromising load-bearing capacity or torsional rigidity; indeed, possibly even increasing both, along with better “deadness” (vibration-absorbing ability). Watch for their new YTL series. 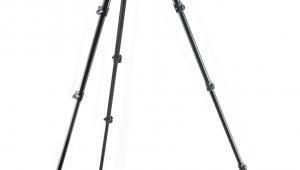 Bucking the trend of smaller, lighter tripods is the Cullmann Titan. It is big, and, by modern standards, heavy at 4 kilos (8.8 lbs). But it will hold up to 21 kilos (46.4 lbs); the maximum height is 162 cm (over 65”); and its two-section “reverse tube” legs (with the bigger tube on the lower section) are sealed up to 50 cm (19.5”), so it can be used in mud or water, or on sand, with much less likelihood of the sections jamming. Better still, the leg locks are at the top and can be operated very quickly, a feature which is as useful in the studio as on location. One model has an air-braked column; the other (a little heavier), a geared center column. 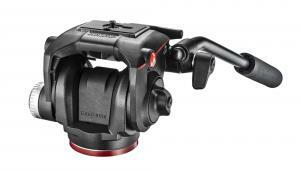 Like all Cullmann tripods it has a 20-year warranty and spare parts are available. 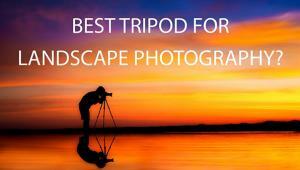 This is another big advantage of top-quality tripods and heads: they can be repaired. Going from big to little, Induro introduced a smaller version of their Hi-Hat (effectively, a just-above-ground-level tripod) which will hold up to 75 kilos (165 lbs): the older model is bigger and heavier but holds up to 100 kilos (220 lbs). Hi-hats are used in the studio to hold lighting or other studio accessories, or as very low (including tabletop) tripods. 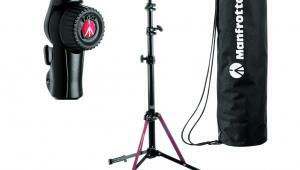 Berlebach’s “hi-hat” shares components with other, bigger tripods in the range. An interesting concept from Berlebach is a modular tripod that dealers should be able to build to your specifications from a range of interchangeable components. First choose the leg length; then add a plain top (no center column)…or maybe a geared center column or a leveling center column…put a panorama plate on top…there’s quite a choice, and you can have exactly the tripod you need, without paying for anything you don’t want. Also, if you want, you can then order spare or replacement parts, and reconfigure the tripod yourself. 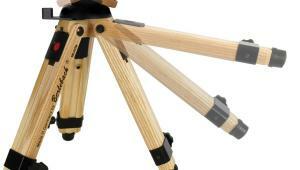 Berlebach are top-quality German-built wooden tripods; are distributed in the US by HP Marketing; and are surprisingly affordable. Although several tripods now feature a removable leg that can also be used as a monopod, there is still a market for stand-alone (as it were) monopods. Cullmann’s very solid Titan monopod is constructed similarly to the Titan tripod described earlier, and Uni-Loc has both 2 meter and 3 meter monopods which are designed to be used with a harness, rather like the harness used by a flag bearer. These are very useful with remote monitors, for shooting over the heads of crowds: the cheapest, simplest form of “aerial” photography. Redged also had a 2 meter (about 6’6”) monopod. As well as tripods that double as monopods, you can also buy monopods that double as tripods: yes, with three (very small) legs. Or perhaps feet. Sure, you wouldn’t want to walk away and leave your camera balanced on a Sirui “microphone stand” monopod foot, but as long as you are next to it (ideally, with your foot on it), it can be a useful extra support. The trend in heads seems to have been modular design: the option of screwing, clamping, or bolting quick-release heads, panoramic heads, cross-slides, and more to the basic head. 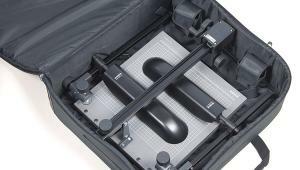 Increasingly, the Arca-Swiss dovetail is the industry standard, and there were many Arca-Swiss-compatible components at photokina. The only thing worth saying about Arca-Swiss “compatibility” is that it is not always 100 percent: some mounts have studs, slots, and other things that get in the way. This won’t matter if you stay within one system, but always check if you use “Arca-Swiss-compatible” components from more than one manufacturer. The leader in this trend, perhaps predictably, is Novoflex. Start out with their newest head, which is an upside-down version of one of their Classic Ball heads. Add a Q-Mount (Arca-Swiss-compatible adapter plate) and you can add panoramic heads, plain tilt heads like the Monolite, pan-and-tilt heads (ideal for video/HDSLR), macro slides (including cross-slides), stereo slides… Linhof was not far behind, with both a new three-way head (the 3D leveling head) and a new Arca-Swiss-compatible version of the micro-drive “block” head (the 3D Micro Leveling Head) which is easier to illustrate than to describe. There was also a new panoramic plate. Cullmann’s new (Arca-Swiss-compatible) Concept One system is more affordable, but still very well made indeed: you’re comparing excellent quality with ultimate quality. Linhof 3D head, available with either Linhof QR or Arca-Swiss-compatible QR. Linhof’s slim, strong panoramic head, available with either Linhof QR (Quickfix) or Arca-Swiss-compatible QR fittings. The Davis & Sanford Magnum video head is so smooth that it feels like a true fluid drive, but it isn’t, and then there were new gimbal heads from Sirui, Induro, and Photo Clam. Usually, you start out with a tripod or other camera support, and then put a head on it. The Red Elephant from Xhia is different. You start out with a head (well, sort of), and then screw legs into that: four, three, or even two. It’s that rarest of creatures in the tripod/head market, a genuinely new idea. It’s… Well, look at the picture. There’s a (red anodized) ball, with a post and panoramic head on it. Then there are two “brackets,” one on either side, into which you can screw tripod legs of various sizes and lengths. A locking arm runs through both of the brackets and the ball. Because the “brackets” move independently, it’s easy to get even four feet solidly on the ground: because, after all, it’s not four, but two sets of two. Or you can rest one or more legs against the wall, or hang the camera upside down, or even use it as a chest pod (I know, I tried). Its only drawback is that it’s very expensive: 799 euros, just the wrong side of $1000, though this includes German VAT (a variety of sales tax) at around 20 percent. It is fully integrated with the only other quadropods on the market, from Novoflex, and indeed relies on the Novoflex for most of its accessories. Red Elephant ball. Legs screw into the sockets on the brackets. Novoflex’s QuadroPod: cross-compatible with Red Elephant, apart from the color. 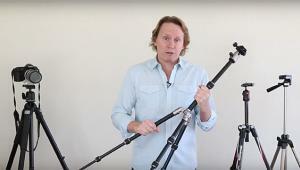 Want to know a lot more about how to choose a tripod? You might care to look at an eBook called Choosing and Using Tripods (and heads and other camera supports) available for $2.99 from www.rogerandfrances.com. I just couldn’t resist this publicity shot.